Yes Hotel Rome is centrally located and is surrounded by a wide selection of wining and dining solutions that offer the possibility to eat indoors or outdoors alfresco style. We have handpicked a few local trattorias and restaurants where you can experience traditional roman and Italian dishes, with fresh ingredients and good prices to match! It is always advisable to try and avoid tourist traps and here at Yes Hotel we would be happy to share our recommendations with you and once you have arrived in our rome hotel would be more than happy to make reservations for you. All guests profit from 10% disount. I Leoni D’Abruzzo is perfect for a good plate of pasta in a friendly atmosphere with good service. 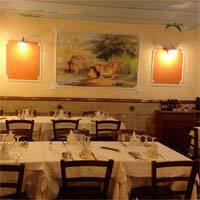 Alocal trattoria that specializes in fresh dishes including meat, fish and vegetables at reasonable rates. Also has the possibility to eat outdoors in warmer weather. The actual dining hall is small and cosy, the classic trattoria ‘all’italiano’ where you can experience the roman ‘amatriciana’ (pasta in a bacon sauce’ or a good mushroom risotto, I Leoni D’Abruzzo have a wide selection to suit everyone all to be accompanied with a good house wine. 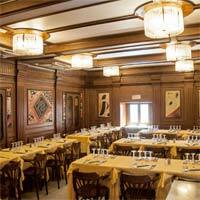 Ristorante Da Vincenzo is a great fish restaurant with ample space and various rooms to dine in. The décor is simple and inviting with wood panelled walls and a warming ambience created with the walls lamps, but the real attraction is the great fish dishes that they create from lobster to fried king prawns, roast fish and potatoes and much much more. Used frequently by locals (always a good sign) Da Vincenzo can get busy and our staff would be more that happy to pre-book for you. All guests profit from 10% disount. 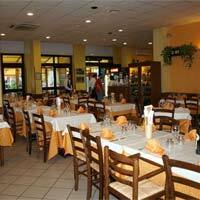 Ristorante Mino is a large restaurant very close by that has an extensive menu to suit absolutely everyone! Just for starters you can choose from clam or mussel sauté sicillian sword fish rolls or grilled squid with rughetta….for those less adventurous there is ham and melon, vegetarian platters and a selection of soups. Main courses range from everything to steaks, grilled chops to pasta and fish dishes with the speciality of the restaurant being the ‘Rigatoni alla Carcerata’ (pasta in a crème fraiche, pea, sausage and mushroom sauce).